It's Pub Night: What's up with the Green Dragon? 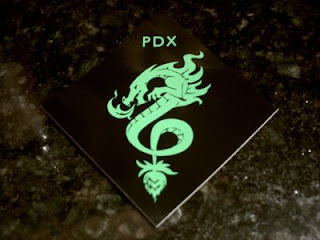 The Oregon Brew Crew mailing list is chattering about a further shakeup at the Green Dragon. Apparently Lolo is out, meaning none of the original founders remains, and I heard from another source that another beloved presence there is also gone. Strange, because I saw both of them there last Wednesday, and yesterday was supposed to be the "One-year not-quite-open party". In less than a year this has become one of my favorite places in the neighborhood. I'll be ticked off if it's going under or if something fishy is happening. Anyone have any details? Leave a comment, or if you want to keep it on the down-low, click on the "Email me" link on the blog. [Update: 2008/07/16] It looks like the tempest has blown over. Their is a new waitstaff and nothing against them but they dont know beer and they are coming in after many founders who were all known in the local beer scene. With that and LoLo gone and the general disrespect to the people who made the dragon any sort of success I cannont consciously go there anymore. Let the boycott commence. bryce: thanks for the eyewitness account. If I wanted servers with no clue about the beer, I'd be at Henry's every night. samurai: I'm not sure about a boycott. For one thing, if the changes are being made to attract a different crowd, my absence helps them out. Still, the personalities are what made that place. If they're not there, why would I go? I watched that go by on the brew crew listserve, but didn't have the moxie to blog on it. Jeff: Jim's sale of his share was pretty well known, if not widely publicized. Dragon people at the time told me they were happy with the new management (that doesn't mean happy to see Jim go, of course). What's got people in a fizz is Lolo's departure (he's still part owner, right? ), and the supposed departure of other fine folk(s). Dammit, and just when Sharon & I were starting to get over our early disappointments with Green Dragon...no problem joining the 'boycott', we're in! When & where is the next Pub Night? Concerning the new staff at the Green Dragon--yeah, it's early, so let's see what happens. Considering the size of the place it seems like they're going to have to pull in a lot more than the beer geek crowd to make it successful--and beer knowledge or being part of the beer community does not necessarily make a good bartender/server. That knowledge can be learned pretty easily. I can't remember the last time I, or anyone I know for that matter, went to a place and said "Hmm, that bartender was pretty aloof and unfriendly, but he sure did know a lot about beer." Well, I guess the larger problem is ... the new staff is aloof, unfriendly AND doesn't know anything about beer.